RESOLUTION 1: CLEAN YOUR MAKEUP BRUSHES! I won’t even begin to tell you the amount of bacteria that lives in your brushes that you’re not cleaning, but I will tell you that Artishas you covered with a cleaning system that disinfects and keeps your brushes looking and feeling like new! This set includes the essential Brush Cleaning Pad plus a travel size [50 mL] Brush Cleansing Foam. The Artis Cleaning Pad includes an antimicrobial microfiber cloth held in place over a rigid base; and the cloth has over a million loops per square inch, creating the perfect surface to wipe brushes clean. 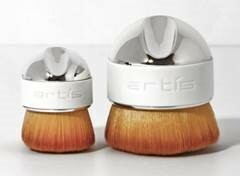 The Artis Brush Cleansing Foam dispenses as bubbly foam which coats each hair fibre. The formula also cleans and sanitizes without the use of alcohol! RESOLUTION 2: TAKE CARE OF YOUR HAIR LIKE YOU WOULD YOUR SKIN! Strong hair and nails start with good health. The SATARA OPTI formula fuses biotin with a proprietary blend of botanicals designed to fortify nails and support the growth of healthy, full, naturally radiant hair. Protects and repairs the hair follicle while helping to support healthy hair function in areas of low density such as the hairline or areas where mechanical damage (hair breakage due to stress from braiding, pony tails, extensions) has occurred. LifeXtend Complex hydrates and nourishes while strengthening and fortifying the follicles and hair shaft for thicker, fuller-looking hair. Spray to Play! Introducing the newest innovation to the styling world that’s never been seen before: a next-generation hairspray that’s part spray and part paste. With revolutionary air technology, L’ANZA’s AirPaste is the first sprayable styling paste. The Palm Brush-Mini is ideal for use with skincare, foundation, concealer, blush, highlighter, contour, bronzer, setting powder and more! It has the ability to target smaller areas, such as under or above the eye lid, along the cheekbone, and around the nose and lips. An excellent companion to other Artis brushes, this new mini size could cut your beauty routine in half with its efficient, gliding performance. Fitting perfectly in the palm of your hand, this minimalistic, handle-free, finger-grip brush allows for focused, stable and comfortable blending and distribution of skincare and makeup. Containing hundreds of thousands of exclusive, trademarked, Artis CosmeFibre, these fibres form a dense and soft bundle, ending with a microscopically small soft tip. This makes blending makeup and skincare products consistent, flawless, and an Animal-Free Beauty experience.